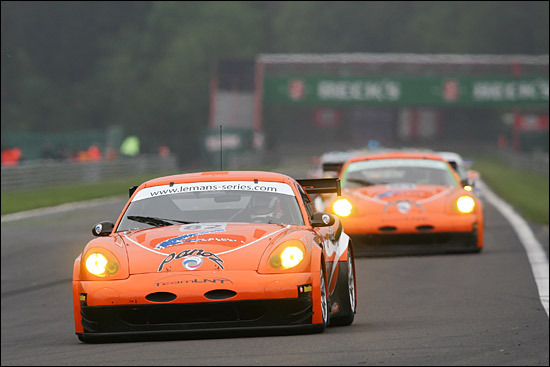 Team LNT’s distinctive orange Panoz Esperante GT-LMs are a difficult pair to miss on this year’s Le Mans Series grid. If anyone had failed to notice them get a podium at Istanbul, it would be impossible to ignore them after a fine performance in a six-hour battle against Porsche, Ferrari, Spyker and TVR at the spectacular Belgian circuit. The #82 car ran well in both sessions, with Dean and Tomlinson getting some Spa miles, or rather kilometres, under the tyres. Their quickest time of the day was set in the morning session – a 2:27.932 being the fifth best in class at the time, but as the competition found a little time in the later session, #82 ended the day ninth. The meeting’s third practice session took place on Saturday morning, on a damp track, but one that had at least been cleansed of its layer of pollen. Tom Kimber-Smith, LNT’s ‘secret’ weapon, was also deployed late in the session, doing a handful of laps on the intermediates before three laps on slicks, the last of which was the best time for the car for the meeting so far – a 2:27.669. 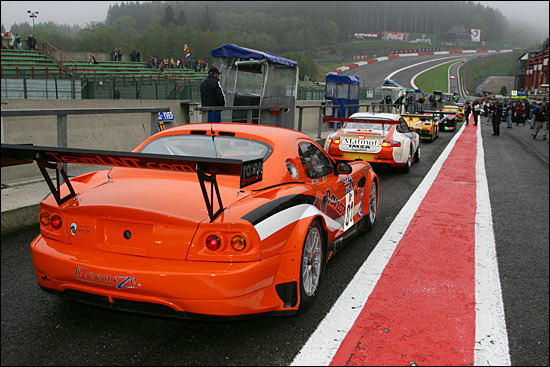 Kimber-Smith’s talent and ability in a Panoz have already been displayed, at the first meeting of the British GT Championship. To secure the fifth fastest time in the class in just a few laps of a circuit he only knows from a computer game was yet further evidence of those inherent skills. Again neither Panoz had yet revealed its optimum laptime, but a 2:27.243 for #81 in tricky conditions was fifth fastest in class. The GT qualifying session took place on a drying track, the drying process having been greatly assisted by the prototype qualifying session that had taken place five minutes earlier. Two GT2 teams took a gamble on slicks and it paid off for one of them – IMSA Matmut – whose star driver, Christophe Bouchut, qualified in an impressive 16th place overall. Anyone who has ever seen a car get out of shape at Eau Rouge would forgive a Spa novice like Kimber-Smith a couple of seconds, so at the end of the day the only person in the team who was harsh about his qualifying performance was the man himself. Race day dawned with the wooded hills around the circuit shrouded in fog. At Les Combes, which is the highest point of the circuit, it was drifting right down to the track surface, but was not so thick as to impede visibility to a dangerous degree. What's Rod Farrell doing here? Race tactics? Rob Bell started #81, with Richard Dean in #82 just in front. Both cars moved up a position before they had even taken the green light, after Christophe Bouchut’s big qualifying advantage was undone in an instant as his team missed the pitlane opening window, meaning he would have to start from the back of the grid. With all the team members, grid-girls and hangers-on cleared from the grid, it was time for the installation lap behind the pace car, ready for an explosion of power across the start line. The explosion of power was dramatic as the cars dived down the long, long hill to the bottom of Eau Rouge, but even more drama awaited the drivers at the top. Dean arrived first and with carnage unfolding in front of him. “There were stopped cars and debris everywhere and I had to choose left or right. I chose right, not because it was easier or anything but it just happened out of instinct. I ended up running over a lot of debris and picked up a cut tyre, so I had to pit.” He completed that lap amid clouds of tyre smoke. In what seemed to be two separate incidents, the LMP1 ProTran and LMP2 G-Force Courage had spun in the middle of the pack and were collected at full chat by the #78 Autorlando Porsche and #73 Ice Pol Ferrari respectively. All four cars were eliminated on the spot with significant damage. There was then an “outrageously slow” safety car period, as the train of cars tried to thread their way past the wreckage, marshals and recovery trucks. Richard Dean emerged from the pits to rejoin the train, but the red flag was wisely shown once it proved impossible to clear the wreckage with the cars circulating. The LNT cars both began a rapid rise through the field though and soon Dean was in 24th and Bell 26th. 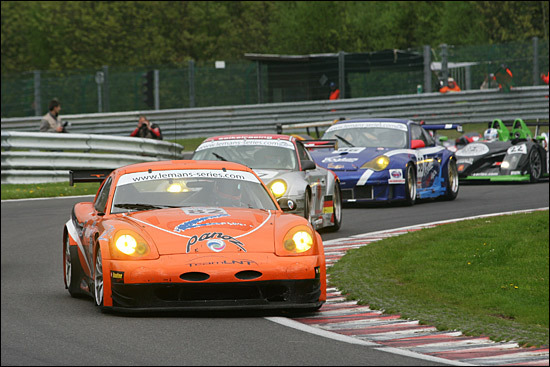 Rosa was the first LMGT2 front-runner to make a routine stop in his GPC Ferrari, and the order became #99 Virgo Ferrari, # 85 Spyker, #90 Porsche, then Dean closing in, with the recovering Bouchut sandwiched between him and Rob Bell. Bell hung on to the storming Bouchut for several laps, but then took his first stop. 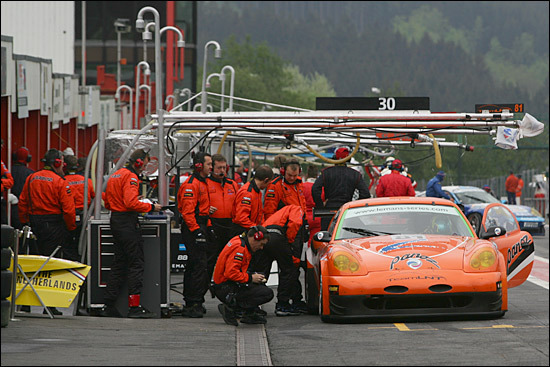 Bouchut passed Dean and the duo began chasing down Bleekemolen in the Dutch Spyker, the #90 Farnbacher Porsche having ground to a halt in the pitlane. It was an impressive early pace from both cars, proving they are contenders for outright speed as well as reliability. 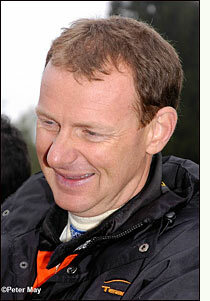 Richard Dean began to drop back slightly from Bouchut and was then to come under attack from the other top-line Porsche of Marc Lieb. Rob Bell was making his way back up through the order after his stop, one of the easiest places he made up was the other Spyker, Jonny Kane having spun into the gravel trap. 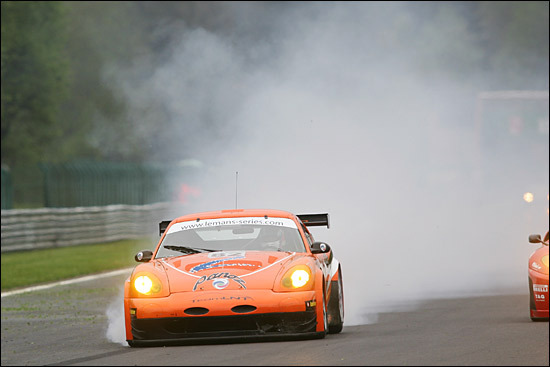 The Virgo Ferrari and circulating Spyker pitted before the chasing pack,so Bouchut and Lieb led Dean, the Panoz moving into a podium spot for the first time. It was a brief spell at the top before the depleted fuel tank dictated a pitstop for Dean too. De Simone, Eagling and Hezemans all re-passed him, so it was sixth and seventh for LNT with 3 hours 40 to go. 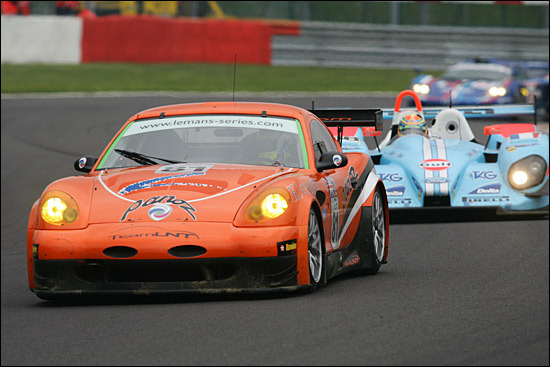 The orange cars were not distant from those in front, and even in endurance racing terms, 3 hours 40 was still a long time to go. Lapping at a consistent pace, both cars had stretched away from all of those behind, which doubtless took some of the pressure away. 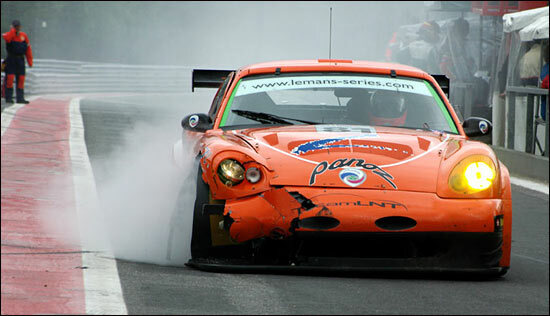 Spyker’s bad day continued as Hezemans was forced to pit again with a problem. Lieb made a routine stop to hand over to Carnathias and Bouchut to Narac. Now was the time for Team LNT to make some in-roads into the leading Porsches, both of the fresh Porsche pilots were good, but would not put themselves in the same league as their team-mates. De Simone led Carnathias and Narac from Eagling and Bell, whilst Dean handed over to Lawrence Tomlinson. It was only a matter of time before Eagling took Narac and both of those closed in on and passed Carnathias. A further safety car period brought about by a crash for the LMP1 Lister helped close things up even more. The leading Ferrari pitted to change drivers from De Simone to Drudi and Rob Bell also came in for Warren Hughes, as Lawrence Tomlinson moved up to fourth. The Safety Car’s passenger was waving cars through until it picked up the leader, so there was not the same amount of bunching as you would normally expect, though pit-lane escapee Hughes found himself nicely placed behind Drudi. Both LNT cars looked strong on the restart, Warren Hughes taking Drudi relatively easily whilst Lawrence Tomlinson made in-roads into Carnathias’ lead. Warren Hughes managed to limp back to the pits, but the broken wheel was the least of the problems: the damage to the front corner was too severe to continue. The team’s focus was now purely upon Lawrence Tomlinson, who initially found himself ahead of Virgo’s Tim Sugden and third in class, an impressive16th overall, but Sugden’s Ferrari had a little more pace and regained the position. 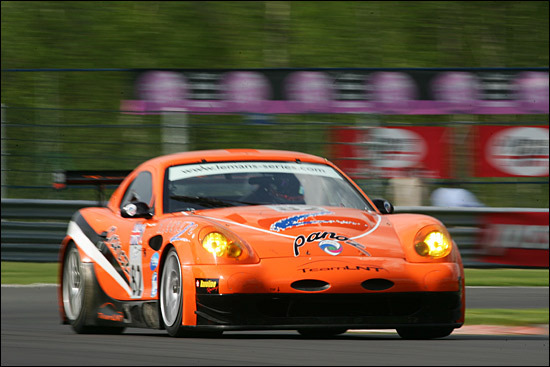 Narac was easily despatched and now the Panoz was holding third place by right, not due to the sequence of pitstops. 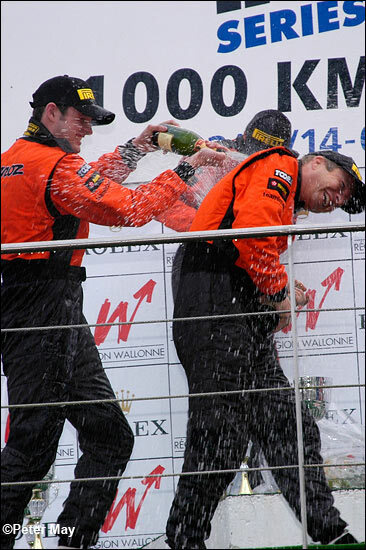 The revised LNT strategy and consistent speed of all three drivers had started to pay dividends in this final third of the race. 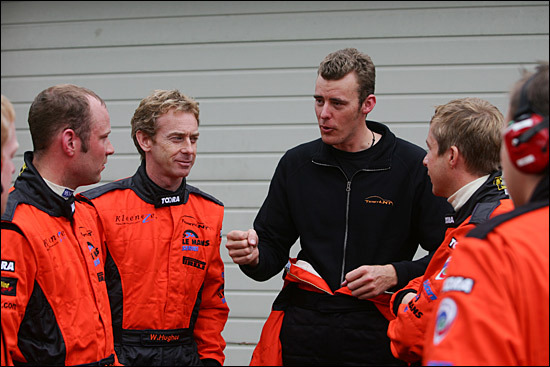 With a second wind and a solid car underneath him, TK-S had posted the fastest lap in his car of 2:26.863 in order to keep maximum pressure on Sugden, but went on to chip a further tenth off that time, lapping at the same pace as Bouchut and Lieb – two (three) very strong drivers in two (three) very good cars. 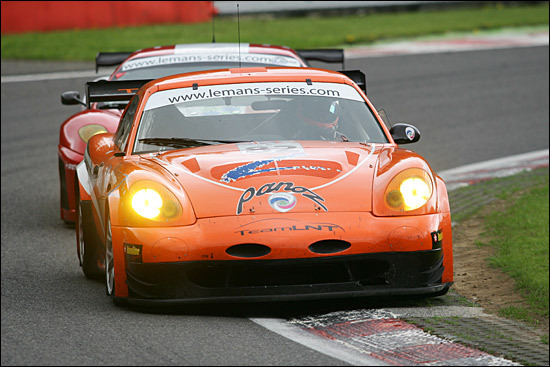 The fact that he was lapping at Bouchut’s pace was emphasised by the fact that the Panoz was almost a lap ahead, practically following the Porsche’s wheeltracks. Those late stage tactical dividends turned into jackpots as Virgo had to make another quick “splash and dash” fuel stop. Sugden had already lost the lead to Autorlando’s Lieb as a result of an unfortunate coincidence between their previous stop and a safety car period, but the splash and dash dropped them another place, to the benefit of Team LNT. Tom Kimber-Smith moved up into an excellent second place in class that he was not to lose, a remarkable 16th place overall, taking the chequered flag some 13 seconds ahead of Sugden in the Virgo Ferrari. 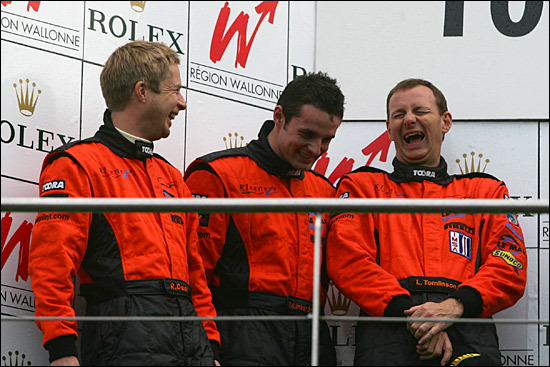 A modest, unflustered but clearly delighted Lawrence Tomlinson summed up the weekend (once he'd stoppped laughing). “Second is pretty much where we expected to be, and we still haven’t got the balance quite right, so we know we can be faster. The best thing is that the car felt like a brand new one right at the end of the race, it was ready for another six hours at least which has to be a pointer in the right direction for Le Mans.” Indeed, not to mention the three remaining Le Mans Series races.